Activated Sludge Treatment of Industrial Waters: Introduction - Pretreatment of Industrial Wastewater - Characterization of Industrial Wastewater - Principles of Biological Oxidation - Acclimation of Biological Sludges - Kinetics of Organic Removal - Activated Sludge Effluent Variability - Bioinhibition of the Activated Sludge Process - Effect of Temperature - Sludge Quality Control - Stripping of Volatile Organics - Nitrification and Denitrification - Activated Sludge Processes - Treatment of Industrial Wastewaters in Municipal Activated Sludge Plants - Application of Powdered Activated Carbon (PACT) - Final Clarification - Effluent Suspended Solids Control - Laboratory and Pilot Plant Procedures for the Development of Process Design Criteria - Activated Sludge Design Procedure for Soluble Wastewater Using Complete Mix Activated Sludge - Design Procedure for a Wastewater Containing Degradable Influent Volatile Suspended Solids - Design for Priority Pollutant Removal - References. "I wish I had this book when I taught my graduate class on biological waste treatment! This is an excellent introduction to biological waste treatment in general. This book would also be extremely useful to wastewater treatment plant operators and could serve as the basis for short courses." 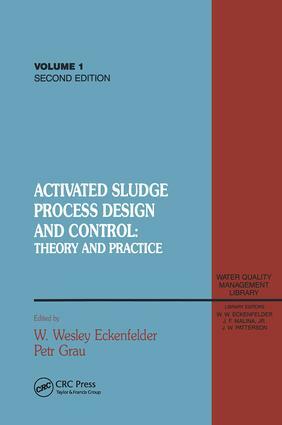 --Richard A. Conway,Senior Corporate Fellow, Union Carbide Chemicals and Plastics Company, Inc.
"An easily accessible book for both specialists and neophytes on the theory of activated sludge."